The Austrian Armed Forces will gradually phase out operations of the current 15 limited Tranche 1 Eurofighter Typhoon aircraft. The transition to a supersonic fleet with unlimited capabilities will begin as of 2020. Austrian airspace is currently monitored under a two-fleet composed by supersonic Tranche 1 Eurofighter Typhoons and the subsonic Saab 105OE. The Saab 105 is near the end of its service life and should be replaced from 2020 onward. 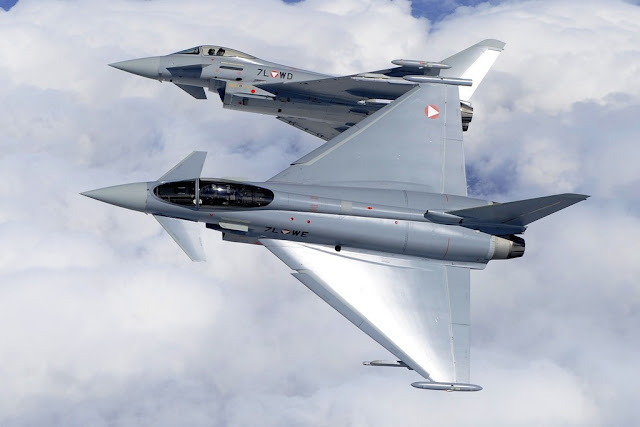 The switch to an alternative one-fleet will be better both in terms of military effectiveness and cost as compared with the planned deployment of the Saab 105OE and the continued operation of the 15 single-seat Tranche 1 Eurofighter Typhoons as currently equipped. The Austrian Armed Forces would have faced total costs of between 4.4 and 5.1 billion euros over the next 30 years to maintain a sigle fleet of 15 Eurofighter Jets with limited equipment. That does not yet take into account the specific cost risk of Tranche 1 or the costs for deploying the Saab 105. The report produced by the special commission "Active Airspace Surveillance", headed by Brigadier Karl Gruber, the commander of the Austrian Air Force, recommends supersonic aircraft with unrestricted operational capabilities both by day and night, the establishment of response capability in case of unauthorised incursions by uncooperative fighter aircraft by equipping the interceptors with an advanced self-defence system and guided missiles with all-weather capabilities, and 100 percent airspace monitoring coverage through supersonic aircraft. On that basis it thus advises a transition from the current "two-fleet system" (15 Eurofighter Typhoons / Saab 105OE) to a single armed fleet with 15 single-seat and 3 double-seat jets stationed at two airbases starting in 2020. Brigadier Karl Gruber: "We had talks with Airbus and alternative suppliers as well as governments. On that basis we have evaluated 19 conceivable options for the monitoring of Austrian airspace both from a military standpoint and in terms of economic efficiency. The result: The security and economic criteria can be met either through the procurement of a high-performance alternative interceptor fleet, while phasing out the existing Eurofighter fleet, or by retrofitting the 15 Tranche 1 Eurofighter Typhoons and procuring 3 used double-seater Eurofighter Typhoons. However, continued operations with the existing Austrian Eurofighter fleet would involve cost risks that are difficult to quantify at present." The Brigadier General added that, outside Austria, the Eurofighter Typhoon Tranche 1 fleet is operated only by the Eurofighter countries, namely the UK, Germany, Italy and Spain, and that every one of those countries has other future concepts. Gruber: "Consequently, it appears likely that there will be no uniform Eurofighter Typhoon Tranche 1 system in the future."